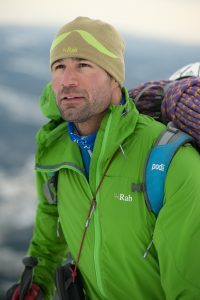 Richard Parks is a former Wales international rugby union player turned Extreme Environment Athlete. During his professional career spanning 13 years, he played for Pontypridd, Leeds, Perpignan and Newport Gwent Dragons. Following his forced retirement from rugby, Richard made history twice with two incredible feats of endurance; a world first expedition called the 737 Challenge, where in July 2011 he became the first ever person to climb the highest mountain on each of the world’s 7 continents and stand on all 3 poles within 7 months. Richard was elected a Year of Adventure Ambassador for Wales in 2016 and proudly serves his country as a Sports Wales board member. Can you first please briefly go through your education and career? I was born in Pontypridd and educated at Monmouth School. After completing my A-Levels I accepted a scholarship to Michaelhouse College in South Africa for a post-matriculation year to study Chemistry A-Level. The first cross roads in my life saw me return to the UK to accept a place in Cardiff University to study dentistry and sign my first professional contract with Newport RFC instead of staying in the Natal Sharks Rugby Academy and studying in South Africa. During my third year of university, I broke into the Welsh Sevens squad and was called up to train with the senior national team. This was to be the second crossroads of my life and with the support of my family I made the difficult decision to take a sabbatical from my studies in order to focus on my rugby career. I often joke that I took that two year sabbatical 12 years ago… and technically I might even still be a dental student! That opened the door to a wonderful chapter in my life culminating in winning four Welsh caps, representing Wales in the 2001 Sevens World Cup and the Barbarians, and wining the Powergen and Principality cups with Leeds and Pontypridd respectively. I am privileged to have represented my country both in the sevens and fifteens and ply my trade in Wales, England and also in France with USA Perpignan. My career was cut short due to an injury, I tore the cartilage out of my right shoulder socket. That was a really difficult period of my life. The French call it la petite mort which really resonates with me. It was a really dark period as I wasn’t ready to retire and didn’t want to retire. Nevertheless, it was this dark place that opened the door this wonderful chapter of my life as an extreme environment athlete and public servant. How did you decide to become an extreme environment athlete? It was a sentence from my grandmother’s funeral: “The horizon is only the limit of our sight”, which combined with a book I was reading by Sir Ranulph Fiennes’ inspired and encouraged me to pick myself up from that dark place and channel my energies into something positive. It was learning how to climb that I believe saved my life. Over the next two years following my injury, a number of people who I met during my journey and who are now friends, sponsors, mentors, employers helped me develop the 737 Challenge, a vision that at the time lead many to think I was crazy! In 2011 I became the first person to climb the seven summits (highest mountain on each of the world’s seven continents) and stand on the Three Poles (The South and North Poles, and the summit of Mt Everest) in the same calendar year, completing the world first project within seven months. It was my way out of a dark place, turning my negative emotions into positive ones. I work hard, but I feel really blessed. The emotional growth, performance skills and friendships that that journey gave me have irreversibly changed my life for the better. Now I earn a living as a high performance athlete again and am able to use my experiences, insight and profile to add value to our world. I have developed and executed three world-first projects now, each of which has had an impact through education, research or charitable objectives. Whilst I am driven to push the boundaries of human performance, there are two strands that connect all the dots in my life: representing Wales and Britain, and public service. It’s a slightly antiquated ideal, but I take great pride in using my projects and insight for the advancement of our societies. I am privileged to be a government appointed board member of Sports Wales, the national institute of sport in Wales which is responsible for enabling community and elite sport in Wales. The work that I do in the educational sector is also really important to me. I love what I do, It is a privilege to earn a living doing what you love but it is also very important for me to that everyone who wants has the opportunity to enrich their lives through sport or physical activity. I aim through my work to empower others to find the courage and develop the skills to challenge themselves. Being resilient, self-aware and having the optimism to see the opportunities in life’s challenges might seem simple but can be so powerful in making life enhancing decisions. Can you explain your French connections? What is the Franco- British dimension of your life? France has always been a part of my life from family trips as a young boy, playing rugby for USA Perpignan, publishing my book in France last year, to having just returned from my friend’s chalet in Samoens last week! I have lots of nice memories of my family camping holidays in France, skiing every year, eating moules au Rochefort off a BBQ in St. Nazaire and city breaks in Paris. Oui. J’ai appris le français quand je jouais pour Perpignan mais j’ai beaucoup oublié. I love the French language. My true relationship with France really began when I moved to Perpignan to play for USAP. I was excited and proud to play in the Top14. It was a real privilege to experience the Catalan culture and to be welcomed into such a passionate community. My season in France didn’t play to the script that I had imagined as I got injured quite early on and found it very difficult to get back on track. This meant that I only stayed for one season when I had initially planned on staying for much longer. Nevertheless, my year at Perpignan was impactful to me. I made a lot of good friends that year and I grew to understand France more, although Catalonia is wonderfully unique! I loved the opportunity to immerse myself in the culture and language… that was really important to me. I am grateful that USAP invited me back after I completed my 737 challenge to help me raise funds in aid of Marie Curie Cancer Care and address the guests in French after the game, which was awesome. For each of my projects, the media in France have always been very supportive for which I’m grateful. It was funny to be called Le cobaye de l’Everest ahead of my research expedition Project Everest Cynllun last year! I had no idea what it meant until my friend’s French wife back in Wales translated it! Ha! I think one of my proudest moments was having my book Beyond the Horizon, which was named best rugby book at the Cross British Sports Book Awards 2015, published in the French language. I spend a lot of time skiing and training in the Alps. I worked closely with the Les Crosets-Champéry ski resort this year. It’s amazing that the resort has hosted the Welsh Alpine Ski Championships for the last 11 years, agreeing another 10 to their relationship. I deeply value and I am proud of the friendships that I have in France. You visited Paris last year as a Year of Adventure Ambassador for Wales, and participated in events at the Franco-British Chamber of Commerce and the British Council. Could you explain the purpose of your visit? One part of Wales’ Year of Adventure campaign, which was an initiative by Welsh Government, was a European roadshow. As a Visit Wales Ambassador and having a passion for France I was proud to be a part of the Paris event. It also coincided with the launch of my book in France, which was awesome. As part of the Paris event I had the privilege of addressing the Franco-British Chamber of Commerce discussing the role that Wales has played in the development of my expeditions – economically, geographically and academically. That was a lot of fun and fantastic to be able to contribute to the Franco-British relationship. I also addressed an audience from both the French and British university sectors at the British Council, discussing more specifically my work with the university sector in Wales in the development and legacy of my projects. Both the Year of Adventure campaign and your BBC broadcast Extreme Wales promote your country as a unique adventure destination. What places would you recommend a French tourist travelling to Wales for an extreme sports holiday? It would be remis of me not to acknowledge how beautiful and wonderful a country France is however, I was really proud to be part of the Year of Adventure campaign last year, which contributed towards Wales’ most successful tourism year in history and saw North Wales voted 4th in Best in Travel destinations of 2017 by Lonely Planet. What I love about Wales is the variety of geography for a relatively small nation which makes things much more accessible, yet you can feel as if you’re ‘off the grid’ in untouched beauty just a stone’s throw away. Of course there are many places in the world that have wonderful mountains and wonderful coastline, but what I think makes us really special in Wales is just how accessible it all is. I live in Cardiff, and if you arrived in Cardiff within less than an hour you could be in the Brecon Beacons in Waterfall Country. Which is exactly as it says! In fact, they filmed some of the Batman films there. In a couple of hours you can drive West along the coast to Pembrokeshire. Which is a wonderful part of Wales, full of hidden gems. Some of our best adventure attractions have been ingeniously developed using the abandoned sites of former heavy industry which I believe is a testament of resilience. Beyond the main external objectives of the adventure campaign, I loved that it encouraged and inspired people from Wales to explore their country and also to embrace the spirit of adventure by challenging themselves. I fell in love with the Elan Valley. This area often gets overlooked by the three national parks around it, but it’s beauty took my breath away. Did you have the opportunity to practice extreme sports when you played for USAP in Perpignan? Where the Pyrenees appealing for extreme sport consideration? Any other places in France you would recommend? Unfortunately, I did not have the chance to as there are strict contractual rules preventing us from ‘extreme sports’. Well that’s my story and I’m sticking to it! However, we did have a pre-season training camp in the Pyrenees, which was awesome. I mean, it was tough; I spent much of the week throwing up as opposed to enjoying the beauty of the Pyrenees, but it is an amazing place. I am more familiar with the Alps, the other side of France. I love my time there. I genuinely can’t decide whether I prefer cycling during the summer months or skiing during the winter! One of my favorite holidays was renting a camper van to follow the Tour de France. It was an amazing couple of weeks. I’m lucky to have friends that live in various parts of France, as I mentioned I was in Samoens last week. I really like the skiing in Ports de Soleil, and am looking forward to working with Le Croset – Champery further with Snow Sports Wales over the coming years. Sport and physical activity plays an important role in the well-being of Wales and in our society. We are people forged by the geography of our country and historically have always been adventurous and active. In my opinion, sport is an important part of our national identity too, it certainly has the power to inspire and unite us – you only have to be in Wales, anywhere in Wales, when one of our national teams are playing! Sporting events also contribute towards our economy like hosting the UEFA Champions League in Cardiff and also the sports adventure tourism I’ve mentioned earlier. However, sport has an equally important role in our communities at grass roots level. Sport comes in many forms and in Wales we’re proud to have some of the highest weekly participation figures for children and adults with 48% and 41% respectively taking part in sport 3 times a week. With an increasingly sedentary population though, sport at community level has an increasingly important role in the wellbeing of future generations. Returning to your involvement with the British Council. How do you perceive higher education cooperation between Wales and France? Are there any areas in which this synergy could be strengthened? This is very interesting, but I’m not sure I’m qualified to give an opinion although I’ve actually returned to education as a student to study a MSc in Leadership and Management at Cardiff Metropolitan University. My perception though is that there is a strong relationship between Wales, Britain and France in the higher education sector. It’s always wonderful to see exchange opportunities and the mobility of students particularly across the Channel. Anytime we have the opportunity to widen our experiences is an opportunity for us to grow. With the uncertainty of times ahead, any efforts made to strengthen the Franco-British synergy and cooperation between organisations is going to take a new level of importance in my opinion. I certainly hope that the higher education sector can continue to build the strong links between our two countries despite the uncertainty that lies ahead.